The WEIGHTED PYLON is the safest and most durable Pylon on the market. Made of a high-tech "I" skin molded foam with a weight embedded at the bottom. Heaviest pylon on the market. Won't blow over. Won’t puncture and lose their weight like sand-filled pylons. Always stands straight. 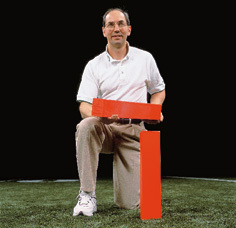 Shock absorbing foam protects the player in case of contact with the Pylon. Fluorescent color is luminous and long lasting because the color is dyed into the foam. No fabric cover to tear or fade. Designed for use on grass or turf. Preferred Pylon of the NFL!